Meyers was reacting to top Democrat contenders, such as Sen. Elizabeth Warren (D-MA), Sen. Kamala Harris (D-CA), and failed Senate candidate Robert "Beto" O'Rourke, kowtowing to racial activist Sharpton regarding ill-defined slavery reparations at the National Action Network's annual conference earlier that week. "It's more of that blame whitey movement mania, madness," the former ACLU leader told host Laura Ingraham, The Blaze reports. "And it's sheer racial rhetoric, and that's what you get at the Al Sharpton so-called 'house of justice.' You have befoolery, and you have diversion, you have distraction. You have this notion of farce." "So at that house of so-called 'justice' you have either a horror picture show showing, or you have a farce. Either way it is not to be taken seriously," he added. Meyers went on to scold top Democrats for giving legitimacy to "racial blowhard" Sharpton. "I can't understand how serious presidential contenders can give legitimacy to a racial blowhard," he said. "And I think it is outrageous and silly and idiocy on the part of the presidential candidates." Reparations is an "unintelligent" concept, Meyers said, arguing that any such collection from white people would just "go to people who are hustlers, who are pimps" — another apparent shot at Sharpton. "And I resent it, and I think it's shameless, and I think it's racial idiocy," he said. "And people who have sense, who are intelligent need to address this as such." Meyers mocked the notion that taking money or property away from white people today would heal the wounds of slavery: "Anybody who thinks that white Americans are going to take the blame or going to feel guilty or give their land and their property away in some sort of reparations pot because they feel responsibility for the sins of their forebears, they're not," he asserted. Ingraham highlighted a potential "racist" component of reparations: "You’re actually just saying the guy who came here from Serbia six months ago, somehow is going have to give a check for a Somali refugee who came here 20 years ago. None of that makes any sense to most people," she said. "That's why I say it's unintelligent," Meyers responded. "Nobody is giving up their house, nobody is giving up their land. Nobody is giving away acres, 40 acres are gone. And nobody — not even a building is going into that reparations pot. So what are they talking about? These people are, they are chasing a farce." Last month, Warren backed the idea of reparations, though she stopped short of explicitly calling for monetary payments. "This is a stain on America and we’re not going to fix that, we’re not going to change that, until we address it head on, directly," the senator said at a CNN town hall event, as reported by Vox. "And make no mistake, it’s not just the original founding. It’s just what happened generation after generation." 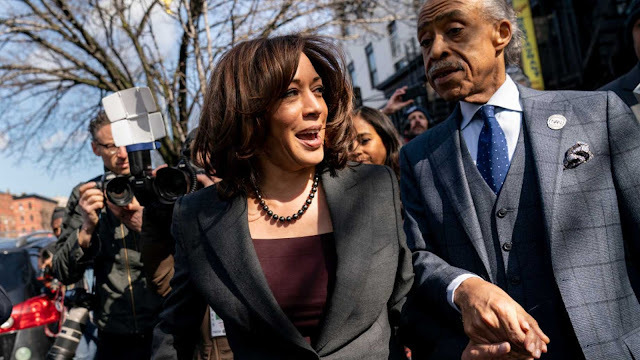 Harris, too, offered her support for a bill exploring reparations for black Americans when prompted by Sharpton last week. "When I am elected president, I will sign that bill," she told the racial activist.